9 ounces bittersweet chocolate, chopped into chunks, or 1 1/2 cups -bought chocolate chips or chunks. Position the racks to divide the oven into thirds and preheat the oven to 350 degrees F. Line two baking sheets with parchment or silicone mats. Whisk together the oats, flour, baking soda, spices and salt. Working with a stand mixer, preferably fitted with a paddle attachment, or with a hand mixer in a large bowl, beat the butter, peanut butter, sugar and brown sugar on medium speed until smooth and creamy. Add the eggs one at a time, beating for 1 minute after each addition, then beat in the vanilla.Reduce the mixer speed to low and slowly add the dry ingredients, beating only until blended. Mix in the chips.If you have the time, cover and chill the dough for about 2 hours or for up to one day. (Chilling the dough will give you more evenly shaped cookies.) If the dough is not chilled, drop rounded tablespoonfuls 2 inches apart onto the baking sheets. If the dough is chilled, scoop up rounded tablespoons, roll the balls between your palms and place them 2 inches apart on the sheets. Press the chilled balls gently with the heel of your hand until they are about 1/2 inch thick. Bake for 13 to 15 minutes, rotating the sheets from top to bottom and front to back after 7 minutes. The cookies should be golden and just firm around the edges. Lift the cookies onto cooling racks with a wide metal spatula - they'll firm as they cool. Repeat with the remaining dough, cooling the baking sheets between batches. Preheat the oven to 425°F. In a medium-sized mixing bowl, combine the flour, baking powder, baking soda, salt, and Pizza Dough Flavor. Add the butter, cut in pats. Work in the butter till the mixture is crumbly. Add the sausage and cheese, mixing to distribute. Add the yogurt, buttermilk, or sour cream. Mix just till everything is evenly moistened. Transfer the dough to a piece of parchment or a lightly floured work surface. Pat and roll it into an 8" x 10" rectangle about 3/4" thick. Cut the dough into twenty 2" squares. If you've been working on parchment, simply lift the parchment onto a baking sheet. Separate the biscuits so there's about 1" between them. If the biscuits aren't on parchment, space them on a lightly greased baking sheet, leaving about 1" between them. Bake the biscuits for 20 to 25 minutes, or until they're a medium- to deep-golden brown. Remove the biscuits from the oven, and cool them on a rack briefly. Serve warm. 3. Grate 1 cup of the soap bar. Add to bowl with Borax and washing soda. I am using Zote this time. I usually use Fels Naptha, but found this at my Super Target and thought I would try it. 6. Use 1 Tbsp per load. That's it. It's as easy as that. It only cost me pennies per load. A very frugal alternative to store bought detergent. It works well too. If I have a really dirty load I will up the amount I use by a small amount. I know that people use Oxyclean also. Have you made your own laundry detergent? What did you think? Coleslaw is a great salad for the summer or any time as it is can be made ahead and keeps well in the fridge for several days. 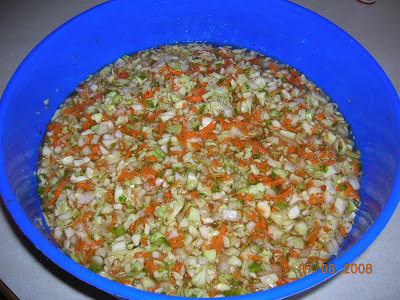 This coleslaw dressing recipe is easy and super healthy too. It's low in calories, fat, cholesterol and sodium which is great if you are watching what you eat due to health concerns or if you are trying to lose weight. Cabbage contains lots of fiber and nutrients so enjoy this tasty salad with out worries! Stir together yogurt, vinegar, honey and pepper in a large bowl until well combined. 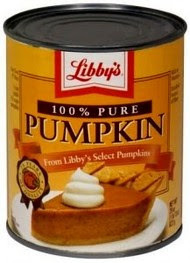 Use immediately or store in a covered container in the fridge for several days. Prepare vegetables, add dressing and mix well. Cover and chill for at least 30 minutes. You may want to drain liquid before serving. Makes about 4 servings. Cook potatoes in boiling, salted water until tender. Drain. Mash potatoes in a large bowl. Add cream cheese, sour cram, salt, pepper, and garlic. Beat with electric mixer until smooth. Stir in chives. Spoon into a lightly greased casserole dish. Sprinkle with paprika and dot with butter. Bake at 350° for 30 minutes or until lightly browned. In a large saucepan, cook the beef, onion and garlic over medium heat until meat is no longer pink; drain. Add the remaining ingredients; bring to a boil. Reduce heat; simmer, uncovered, for 30 minutes or until heated through. Yield: 5 servings. Prepare in large skillet bacon and fry until crisp. Drain on a paper towel, crumble and set aside. 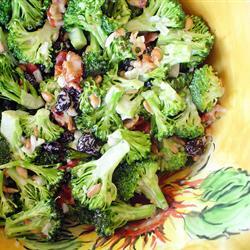 In a large bowl, combine broccoli, raisins, sunflower seeds and red onion. In a small bowl, stir together mayonnaise, sugar and vinegar. Spoon over broccoli mixture; toss to coat. Sprinkle bacon over salad and toss. Cover and refrigerate 3 hours or overnight. This doesn't taste very much like Chinese food, but it tastes good anyway! It has a pleasing crunch to it. Fast, quick & super easy. Tastes surprisingly a lot like tamales. Preheat oven to 350degrees. Crunch up all the chips and put on bottom of 13x9 pan. Open can of corn and dump over chips without draining first. Stir it all up to mix. Next spread the chili over the top. Put in oven and bake about 20 min. Remove, add cheese, return to oven for another 5-10 minutes till it melts. set aside. Coat a nine inch square baking dish with nonstick spray. Place half of the lasagna noodles on the bottom. Spoon half of the cottage cheese mixture onto the noodles. Spread half of the vegetable mixture over the cottage cheese mixture. Sprinkle half of the mozzarella over that. Repeat the layers. Cover with foil and bake for 20 to 25 minutes. our test kitchen developed this new way that everyone loves. enjoy them as a snack or an edible garnish. (Wish I could eat some of this cake, its beautiful when made, 4 chocolate cake layers with green frosting piped or spread between each layer and a chocolate ganache on each layer too, talk about yummy). CAKE LAYERS---Heat oven to 325 degrees. Butter and flour 2 parchment lined 9" round cake pans. In bowl, combine first 3 ingredients, let cool. Sift together flour and next 3 ingredients. In bowl, beat butter and shortening until light and fluffy. Add sugars, beat 5 min. Beat in eggs. Stir in vanilla. Alternate adding flour mixture and cocoa mixture. Divide batter between pans. Bake 35 min. or until done. Let cool 20 min. invert onto rack. Let cool completely. Remove parchment. Trim cakes to level, halve each layer horizontally to create 4 layers. *BUTTERCREAM- --In saucepan, whisk sugar and flour. Add milk and cream. Cook 20 min. or until mixture comes to a boil and thickens. Transfer to bowl. Beat until cool. Reduce speed, add butter, beat until light and fluffy. Stir in creme de menthe and peppermint extract. *GANACHE---Place chocolate in bowl. In saucepan, bring cream to a boil, pour over chocolate. Let sit 2 min. stir until smooth. Stir in creme de menthe and peppermint extract. Let sit 15 min. or until room temp. *ASSEMBLE CAKE---Place 1 cake layer on platter. Spread with 1/4 cup ganache. Chill 1 min. or until set. Spread or pipe 1 1/4 cups buttercream on ganache. Repeat layering 3 times, then serve. In a large bowl, cream the butter and the sugar until light and fluffy. Add the lemon juice and the eggs. Combine the dry ingredients. Gradually add to the creamed mixture. 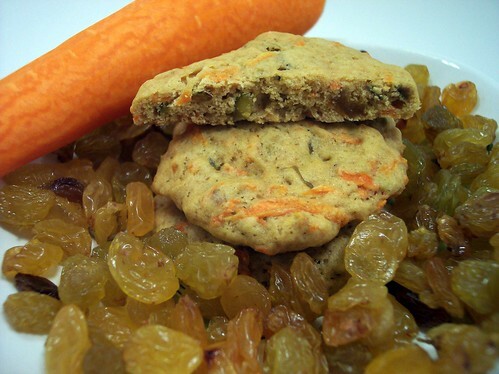 Stir in the raisins. Roll into 1-inch balls. Place on greased baking sheets. Flatten with a fork dipped in flour. Bake at 400 for 8-10 minutes or until lightly browned. Heat oven to 325 degrees F. Mix wafer crumbs, 3 Tbsp. sugar and butter; press onto bottom of 13x9-inch pan. Bake 10 min. Beat cream cheese, remaining sugar and flour in large bowl with mixer until well blended. Add sour cream; mix well. Add eggs, 1 at a time, mixing on low speed after each just until blended. Stir in dry pudding mix until well blended. Gently stir in 1 cup berries. Bake 1 hour or until almost set. (Center will still be jiggly.) Cool completely. Refrigerate 4 hours. Crush remaining berries. Top cheesecake with COOL WHIP and crushed berries just before serving. will not stick. Bake 20 minutes in a 350° oven. Add to be barbecue sauce. This Salsa is commonly known as Salsa Verde'. You may make it with Tomatillos which you may eat raw or processed without changing the taste. You may also make it with Green tomatoes of any type; however the taste will change dramatically if you process this type. Also it will separate during processing which can be remedied by vigorous shaking but it will still look terrible. 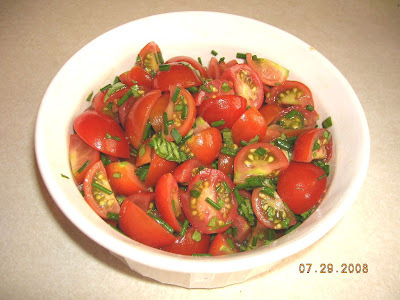 If you grow your own Tomatillos or if you just need something to use all those 'last batch' unripe tomatoes, go ahead and multiply the recipe. 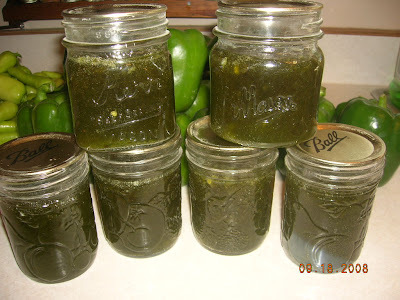 Salsa Verde is good when made as a 'crunchy bits' Salsa or processed with green tomatoes instead of Tomatillos it makes a terrific Mexican Barbecue Sauce or a good base for Pork Chop Burritos or Frajitas. Dice Tomatillos or Tomatoes in Med. small chunks chop all remaining vegetables. finely Juice the lemon Mix all ingredients in medium size mixing bowl gently toss with wooden spoon after adding spices and oil or butter. Put into serving Dish or 1 quart jar and chill for 1 hour and serve. Keeps well in refrigerator for up to 3 weeks. Great with chips and sour creme or on any of your favorite Mexican dishes. Or try it as a steak or chuck roast sauce! MMMMMM! Good! This salsa may also be used as a barbecue sauce on any and all slow cooked meats. If you make a Salsa hotter than your taste buds appreciate, mix with sour cream to add flavor and reduce the fire. Jalapeno peppers come in different shapes and sizes. You can adjust the “heat” down by selecting the peppers with blunt or rounded ends. The more pointed the end of the Jalapeno the hotter it is. This is only true with the Jalapeno peppers. Place roast, fat side up, on rack of a roasting pan. Insert meat thermometer, being careful not to touch bone or fat. Bake at 325 F about 30 to 35 minutes per pound Cool. 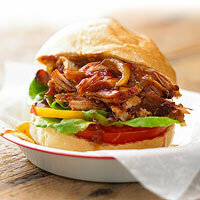 Trim and discard fat; cut pork into 2-inch pieces. Place hen in a Dutch oven, and cover with water. Bring to a boil; cover, reduce heat, and simmer 2 hours or until tender. Remove hen from broth and cool. (Reserve broth for other uses.) Bone hen, and cut meat into 2-inch pieces Coarsely grind pork and chicken in food processor or with meat grinder. 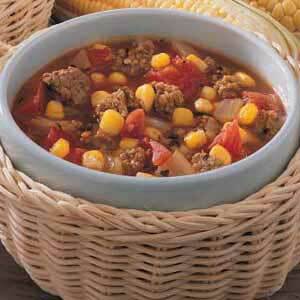 Combine ground meat, tomatoes, tomato sauce, onion, green pepper, vinegar, and sugar in a large Dutch oven. Combine flour and water, stirring until smooth; stir into meat mixture. Stir in salt, pepper, turmeric, and hot sauce. Cook over medium heat 30 minutes, stirring occasionally. Add water, if needed, to reach desired consistency. Stir in corn, and cook an additional 10 minutes. Note: Brunswick Stew freezes well. To serve, thaw and cook until thoroughly heated. 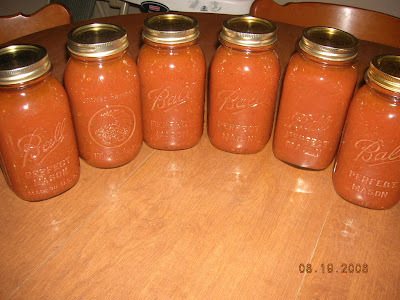 Notes: There are almost as many variations of Brunswick Stew as there are of barbecue sauce. This pork and chicken version seems to be most typical. While a bowl of steaming Brunswick Stew is good alone, it's often served as an accompaniment to Southern barbecue. 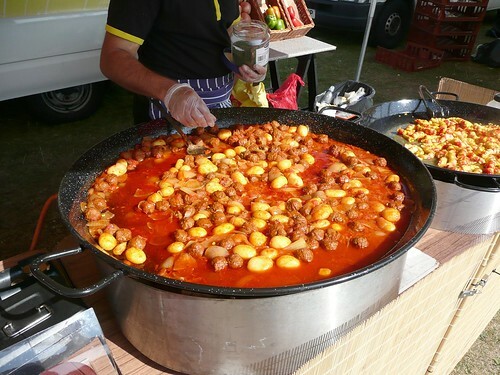 In large mixing bowl, combine KELLOGG'S CORN FLAKES cereal, egg whites, tomato sauce and cumin. Beat well. Add turkey. Mix until combined. Using rounded tablespoon, portion and shape into approximately 18 meatballs. In 4-quart saucepan coated with cooking spray, brown meatballs over low heat. Add onion slices, green pepper, tomatoes, beans, cilantro and water. Cover and simmer 25 minutes over low heat, stirring occasionally. Remove 1/3 cup hot liquid from meatball mixture. Gradually add flour mixing constantly, until smooth. Stir into meatball mixture. Continue cooking 5 minutes longer, stirring frequently, or until mixture thickens. Serve hot. fresh garlic into both sides of each steak. Let stand for 15 minutes. 30 seconds (this first turn is to ensure that one side is seared). turning, and to replace on top of the meat after turning. In large bowl combine rice, chicken, corn, beans, bell pepper and jicama. Gently toss until well mixed and set aside. In a medium bowl whisk together olive oil and lime juice until well blended. Mix in the salsa and hot pepper sauce. Add enough water to thin the consistency so dressing can be thinly drizzled over salad. Drizzle dressing over chicken mixture and toss to coat salad ingredients evenly. Cover salad and refrigerate 1 to 3 hours so flavors meld. Bring salad to room temperature and check seasonings before serving. Season to taste with salt and pepper. Drain any excess dressing. Place salad in serving bowl lined with lettuce leaves. Sprinkle top of salad with cilantro and cheese and serve. Summer time seems to be a time that I find myself on the go allot. The teens are all at home with many plans of their own and my life gets bundled even more. Anything that gives me a boost at an organized life is something that I am very welcome to. The Purse Perfector does just that. Unzip all three sides for a separated bag, smaller purse or fanny pack; Because of the stable, flat bottom, it sits upright when changing purses. No matter how you use the purse perfector you can be sure that it will help keep you organized and allow you to wipe off easily to clean. I received a purse perfector and must say that it has worked out quite well. My keys are now easily found, I keep an open compartment for cash and items that the teens hand me to hang onto when we are out as well. Win a Purse Perfector: One of Annies Home lucky readers will recieve their own Purse Perfector. To enter giveaway you must follow Purse Perfector on facebook and leave message letting them know you entered giveaway @ Annies HOme. better, it's so rich and sweet that it works as either a side dish or a dessert! slightly thickened, stirring constantly; set aside to cool. Meanwhile, in a medium bowl, combine the grapes, cherries, pineapple, and bananas. Fold in the egg mixture until evenly combined, then top with the whipped topping and walnuts and chill overnight to "marry" the flavors. you want to make this your own. Mix all together, except the Ritz crackers. Put in 1 1/2 quart casserole and top with crackers. Nice side dish to a baked ham and mashed sweet potatoes. Combine all ingredients in a blender in the order listed; process mixture until smooth, stopping to scrape down sides. Prepare homemade crust or allow frozen crust to thaw. Preheat oven to 375. In a large skillet saute the zucchini & onions in the margarine for about 10 minutes or until softened . (I also added half of a green pepper, diced) Add the spices & stir well. Set aside. In a large bowl combine the eggs & cheese, mix well. (our favorite is cheddar cheese) Add the zucchini mixture & stir till well blended. Use Dijon mustard to paint inside of crust. ( I used a thicker layer of dijon one time & did not like it. I use about 1 t. of it, but you can use more if you like it.) 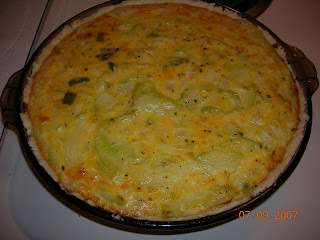 Fill the pie crust with the zucchini mixture & bake for 18-20 minutes. (I added another 5 minutes to lighlty brown on top) Allow to stand for 10 minutes before cutting & serving. Finely chop peppers in food processor. Strain, pressing lightly. Measure 2 full cups & 1/4 c. pepper juice. Discard remaining juice. Combine the 2 cups of ground peppers, 1/4 c. pepper juice, sugar, & vinegar in 4 quart pan. Bring to a boil, stirring frequently. Remove from heat & let stand for 15 minutes. Reheat to boil, stirring constantly. Add lemon juice & return to boil for 1 minute, stirring. Add pectin & let boil for 3 minutes, skimming off the foam as it accumulates. Pour into sterilized pint or half pint jars & process in a boiling water bath for 10 minutes, making sure the water is 1/2 to 1 inch above the lids. Remove from water & let jars sit on the counter overnight. Check in the morning that they have each sealed (they usually seal within seconds of removing from the water). Aloha Friday hosted by the An Island Life blog where Kailani shared with us in Hawaii Friday is the day of rest where they take it easy to prepare for the weekend. 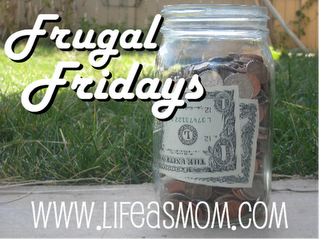 Aloha Friday is where bloggers ask each other simple questions with simple answers. You can join in as well. Have you seen any great movies lately? What was it? What is your favorite movie? Shred cabbage, green pepper, and carrots. (I did it in the food processor.) Add onion. Sprinkle with salt; let stand 1 hour. Drain. Combine remaining ingredients in a saucepan. Bring to a boil; boil 3 minutes. Cool. Pour over cabbage mixture; let stand 5 minutes. Stir well. Pack in can or freeze jars or plastic freezer boxes. Seal; label; and freeze. Yield: about 5 pints. In a large pot, combine all ingredients except the sugar, bring to a boil, and cook at a steady boil for 2 hours. Remove from heat and strain through a colonder or food mill, making sure to express all the liquid you can. Discard the pulp, return the liquid to the pot, and boil for another couple of hours, or until the liquid is reduced to roughly three quarts. Add four tablespoons of sugar, remove from heat, stir, and let cool. Mix the sugars, shortening, eggs and vanilla in a large bowl. Then add the flower, baking soda, salt and m&ms. Drop by tablespoons onto a cookie sheet (i use foil on my cookie sheets) and bake for 12 minutes or till the bottom is golden. Preheat oven to 350 degrees F. Place the tomatoes in a colander in the sink in 1 layer. Sprinkle with salt and allow to drain for 10 minutes. Layer the tomato slices, basil, and onion in pie shell. Season with salt and pepper. Combine the grated cheeses and mayonnaise together. Spread mixture on top of the tomatoes and bake for 30 minutes or until lightly browned. Saving money can be hard to do but here are a few different ways that we have relied on to save money. Be a one-car family. Not always easy but it works. We walk whenever we can. Get rid of your cable/satellite tv. This will also save you electricity and give you 15 or more hours a week to get more done! I know it does not seem like it but great time for family to catch up. Dust off those old movie tapes and watch them again. Hulu is a great source to watch those shows that you love. Less commercial time this way as well. Mend your clothes. Never thought I would do it but as my children started to wear their socks heels and toes out but the rest being great I started mending like dear old grandma. Also style of today allow small holes in jeans to be present lucky us. Stop shopping. Only go to the store when absolutely necessary. Try to limit your shopping to once every two weeks, or once a month. Buy enough so that you don't have to go more than that. Don't ever run to the store for just one thing. Turn your thermostat to 79º in the summer, and to 65º (or less) in the winter. I did not think that I would be comfortable at temps like this so I tried it this year and must say that I am comfortable and also love the bills as they are the lower than normal for summer months. Use the real thing instead of disposable: towels, napkins, plates, glasses, diapers. This makes it so much more nicer very vintage to me. Plan your meals around the sales, instead of planning your meals and then shopping. Better yet, stock your pantry around the sales, and then make whatever you want! I do this quite often whenever there is extra money I may make a menu to be on guard and change it up depending on sales. I also stock up whenever possible Remember--if you can't afford it, it doesn't matter how good of a deal it is! Peel and seed the tomatoes, working over a bowl and sieve to catch the juices. Heat the olive oil in a large nonstick frying pan. Add the onion and cook over medium-low heat until a rich golden brown, about 6 to 10 minutes. Reduce th heat slightly, add the shallots and garlic, and cook for 2 minutes, or until golden brown. Add the balsamic vinegar and bring to a boil. Add the tomatoes with their juices and tomato paste, brown sugar, herbs, pepper flakes, salt and pepper. Gently simmer the sauce until thick and richly flavored, 10 to 15 minutes, stirring often with a wooden spoon. Correct the seasonings, adding salt, brown sugar, or vinegar to taste. Makes 3 to 4 cups (6 to 8 one-half cup servings). and canola oil stand in for tractional artery-clogging doses of butter. Mix oil, vinegar, Italian herb seasoning and sugar in small bowl. Layer onion and tomato slices on serving plate. Drizzle with dressing. Sprinkle with feta cheese. Heat oven to 350 degrees. In bowl, combine 6 minced garlic cloves, 2 tsp each oregano, lemon zest and fennel seeds, 1 tsp olive oil and 1/4 tsp salt. Mash until mixture forms thick paste. *Place 3 pounds boneless center cut pork loin on cutting board. Beginning at top of loin, cut down the center 3/4 of the way into meat. Spread open loin and repeat incision down center of each half, so loin is open like a book. *Rub 3/4 garlic mixture inside loin. Roll, tie with twine. Rub remaining garlic mixture on loin. Roast pork 1 hour or until thermometer reads 150 degrees. Remove from oven. Let sit 20 min. before slicing, then serve. (Who doesn't like mac and cheese? talk about a comfort food, this is delicious, easy to make, I made it healthier by substituting certain ingredients). ENJOY. Heat oven to 350 degrees. Coat a 11x7x2" baking pan with oil or with cooking spray. Bring a pot of lightly salted water to a boil. Add rotini and cook 5 min. Add green onions and cook an additional 2 min. Drain and set aside. *In a saucepan, melt butter. Whisk in flour until smooth. Add milk, whisking until smooth. Stir in salt and pepper, bring to a simmer. Cook simmering, 4 min. Remove from heat. *Add half of the cheese to milk mixture, whisk until smooth. Stir in corn, then combine in bowl with pasta and green onions. Pour half into dish, top with half of remaining cheese. Repeat, ending with cheese. *Bake 25 min. Cool slightly before serving. Place fennel in slow cooker bowl. Rub pork with 1 tsp Greek seasoning and place in bowl on top of fennel. Scatter tomatoes around pork. Pour 1/3 cup broth in bowl, top with 2 tsp Greek seasoning, 1/2 tsp salt and 1/4 tsp pepper. Cook 3 hours on high or 6 hours on low. *Blend remaining broth, cornstarch and Worcestershire. Remove pork to a serving platter, keep warm. Strain liquid from slow cooker into a saucepan, place vegetables around pork. Bring liquid to a boil. Whisk cornstarch mixture, remaining Greek seasoning and salt and pepper, cook 1 min. Spoon sauce over pork. Sprinkle with olives, if desired, then serve. (Little individual desserts, you can garnish the tops of these with a sprig of mint if you wish, these sound really yummy, sounds like ingredients I could eat, I would make it a very little pinch of salt though). HOPE YOU ENJOY. Heat oven to 375 degrees. In bowl, combine ricotta, yolks, 1 tbs sugar, zest and extracts. Beat egg whites and salt 2 min. or until soft peaks form. Add remaining sugar, continue beating until stiff peaks form. Fold egg whites into ricotta mixture. 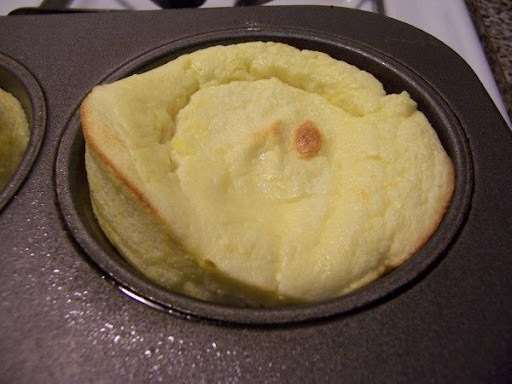 *Spoon mixture into 4 ramekins or ovenproof cups coated with oil or with cooking spray. Bake 15 min. or until souffles have risen and are set. Serve immediately. Pierce potatoes with a fork; arrange in a circle on paper towels in microwave oven. Microwave at HIGH 10 minutes or until done, rearranging potatoes after 5 minutes. 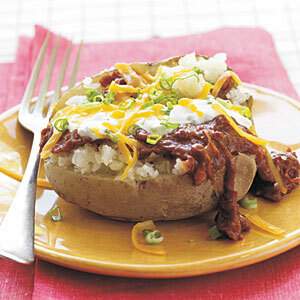 While potatoes cook, combine sour cream and 2 tablespoons onions; set aside. Place chicken in a microwave-safe bowl; cover with plastic wrap (do not allow plastic wrap to touch food). Remove potatoes from microwave; place chicken in microwave. Microwave at HIGH 2 minutes or until thoroughly heated. Slice potatoes lengthwise, cutting to, but not through, other side; fluff with fork. Top each potato evenly with chicken, sour cream mixture, cheese, and remaining onions. Preheat oven to 400°. In a large frying pan over medium-high heat, brown steak and chorizo, stirring, about 5 minutes. Meanwhile, chop onion and mince garlic. Add onion and all but 1/8 tsp. cumin to pan. Stir often until onion is soft, 4 to 5 minutes. Reduce heat to medium; stir in 1 1/2 cups salsa. Simmer until thick, 8 to 10 minutes, stirring occasionally. While steak mixture simmers, combine black beans, 3/4 cup water, oregano, 1 tsp. garlic, and chiles in a small saucepan. Bring to a boil over high heat, then reduce heat to medium and simmer until all but about 1/4 cup liquid has evaporated, 10 minutes. Meanwhile, make guacamole: Pit and peel avocado. In a bowl, mash avocado with remaining 1 tbsp. salsa, remaining 1/8 tsp. 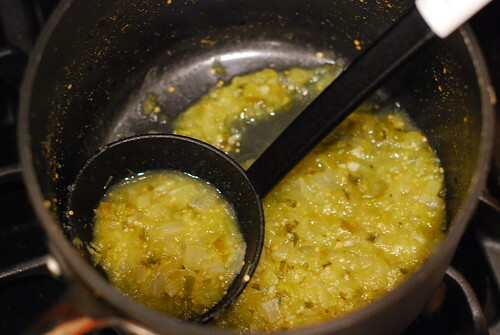 cumin, remaining garlic, and the lime juice. Stir 1 tbsp. cilantro into guacamole and add salt to taste. Line a large, rimmed baking pan with parchment paper. Arrange chips in a 12-in.-wide circle. Sprinkle with cheese. Bake until cheese melts, 3 to 4 minutes. While chips are baking, arrange lettuce around rim of a large serving platter (at least 16 in. wide). With a wide spatula, loosen chips from parchment. Carefully lift parchment from pan, then slide chips off paper into center of platter. Spoon meat mixture over chips. With a slotted spoon, top with beans. 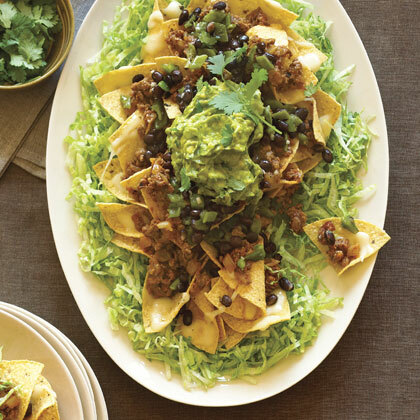 Spoon guacamole over center of nachos and sprinkle with remaining 1 tbsp. cilantro. Today in our town there are no butcher shops or meat shops. Rather the meat here is bought at the local Wal-Mart or Grocery Store where the meat arrives pre-packed. So the freshness of choice is not always at hand. However, that does not mean that you are settled into a price that you must buy. I normally walk into the store and look for markdowns. Last night we hit the jackpot with all meat that was leftover from the 4th of July weekend at a great discount. YEAH for me and my freezer. Total savings around $50. Be sure to watch your meat counter for the same sort of sales. Chop woody ends off asparagus. Microwave for 2 to 3 minutes, or cook in boiling, salted water until barely tender, about 4 to 6 minutes. Plunge into ice water to stop cooking. Drain. Add cherry tomatoes. Stir together vinegar, orange juice and garlic; season to taste. Spoon dressing over asparagus and tomatoes. Sprinkle with Parmesan cheese. Thursday is the day we all come together to share what we are thankful for. We give thanks every day here for lots of things both big and small. Some of those this summer include having enough groceries in the house with five teens home for the summer without breaking the bank. Yesterday while shopping for groceries the cart filled up very fast with needed items. The bill I feared would be very high as well. With 3 teenage boys who all seem to never get filled up the grocery bill can become very hefty. I was very thankful when I learned through coupon so and sales I saved over $75. YEAH!! While that is something to be thankful for there are many more things in our life. Two of my boys are away at camp this week and they were very excited to go. I Thank God that they have the desire to learn so very much more. It is very exciting for me as a mother to sit back and watch as my boys become men of God. Peel cucumber, leaving stripes of peel on it if more crunchiness is desired. Slice lengthwise in fourths. Gently scrape seeds out. Thinly slice each cucumber fourth. Mix yogurt, dill weed, and lemon juice. peanut butter mixture to distribute garlic and ginger, then add to the pan, stirring to distribute sauce evenly throughout. Serve hot. * If you like tofu, you can add 1/2 pound cut into 1/2 cubes. In that case increase the amount of noodles to 12 ounces. Stir together carrots, chicken, broth and 2 tbs soy sauce in slow cooker bowl. Cover and cook 3 hours on high or 5 hours on low. Remove cover and stir in pineapple, peas, and bell pepper and cook an additional 20 min. *In bowl, stir together remaining soy sauce, pineapple juice and cornstarch. Stir into liquid in slow cooker bowl. Stir in cashews and cook an additional 10 min. or until liquid has thickened. Serve over rice, if desired. (You should be able to find the peanut butter pretzel sandwiches in the cracker isle of your grocery store, they are little round pretzel crackers with a peanut butter filling). Add 2 cups peanut butter pretzel sandwiches to a blender, and pulse until they are crushed. Set aside 4 tbs for garnish. Add 2 cups vanilla ice cream to the crushed peanut butter pretzel sandwiches. Add 1/2 cup milk to blender and blend until smooth. *Rim 4 glasses with 1/4 cup peanut butter and Salt, then dip the rims into the reserved crushed peanut butter pretzel sandwiches. Pour shake into glasses, garnish with dollop of whipped cream and extra peanut butter pretzel sandwiches, then serve. (This recipe has 3 versions: Sugar Free Version, Spicier Version & Meaty Version (see below). Heat oil in a saucepan. Add onion and garlic and cook 10 min. Add tomatoes and their liquid, tomato sauce, Italian seasoning, sugar, salt and pepper. Cut tomatoes into bite size chunks in pan. *Bring sauce to a simmer, then reduce heat and simmer 20 min. In a pot of lightly salted water, cook spaghetti according to package directions. Drain pasta and serve topped with marinara sauce. SUGAR FREE VERSION---Replace the tsp of sugar with 1/4 cup peeled, chopped carrot stirred into the oil along with onion and garlic. SPICIER VERSION---Add 1/4 tsp red pepper flakes before simmering. 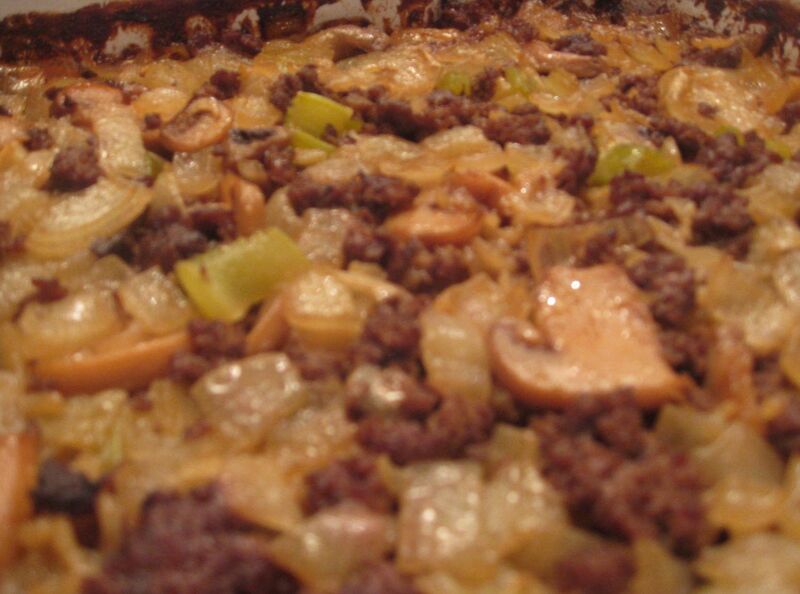 MEATY VERSION---Cook 1 pound lean ground beef or pork along with onion and garlic. Fill a skillet halfway with water, bring to a boil. Poach chicken 7 min. or until cooked through. Let cool, then shred. *Remove skillet from heat and wipe clean. Coat skillet with oil or with cooking spray and place over heat. Cook mushrooms 5 min. or until softened. *Spread all tortillas with 1/4 cup beans. Divide cheese, chicken and mushrooms between 2 of the tortillas. Place remaining 2 tortillas on top, bean side down. *Return skillet to heat. Coat skillet and top of quesadillas with oil or with cooking spray. Cook one quesadilla 4 min. per side or until cheese has melted. Repeat with remaining quesadilla. Cut both quesadillas in half and serve with salsa. Trim fat from meat. If necessary, cut roast to fit into a 3-1/2- to 5-quart crockery cooker. Sprinkle meat with the salt and pepper. In a large skillet brown meat on all sides in hot oil. Drain off fat. Transfer meat to cooker. Add onions, the 1 cup root beer, and garlic. Cover and cook on low-heat setting for 8 to 10 hours or on high-heat setting for 4 to 5 hours. Meanwhile, for sauce, in a medium saucepan combine the 3 cups of root beer and the chili sauce. Bring to boiling; reduce heat. Boil gently, uncovered, stirring occasionally, about 30 minutes or until mixture is reduced to 2 cups. Add root beer concentrate and bottled hot pepper sauce, if desired. Transfer roast to a cutting board or serving platter. Using a slotted spoon, remove onions from cooking juices and place on serving platter. Discard juices. Using 2 forks, pull meat apart into shreds. To serve, line buns with lettuce leaves and tomato slices, if desired. Add meat and onions; spoon on sauce. Makes 8 to 10 servings. The Baby Bunch welcomes babies in a wonderful way with Cupcake Onesies. Cupcake Onesies are the cutest non fattening cupcakes perfect for babies 0 to 6 months or up to 16 lbs. Organic Cupcake Onesies from The Baby Bunch make the perfect baby shower gift. Imagine the awes as the cupcakes are unwrapped by the mother to be. Imagine cupcakes that are the hit of the party and no baking is required. Organic gifts are perfect for parents who are earth friendly and ecologically responsible. 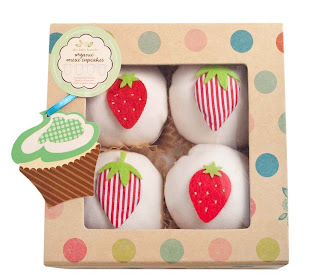 Looking inside the fun polka dotted box you will see four precious onesies shaped to resemble cupcakes. The onesies are made of unbleached, undyed cotton onesies and has a decorative element such as a fruit or flower. The box that the onesies comes in is so cute and sturdy that it can easily be used again. How sweet. Absolutely no baking is required to give the gift of organic cupcake onesies that many will love. Each box of four organic cupcake onesies comes complete with a cupcake gift tag which makes them the perfect baby shower gift. Since onesies are among the desired items for new babies The Baby Bunch cupcake onesies makes the perfect gift whether its for a boy or girl. Preheat oven to 350°. Shape cookie dough into 24 (1-inch) balls, and place in cups of lightly greased miniature muffin pans. Bake 15 to 18 minutes or until edges are lightly browned. Remove from oven, and press 1 bite-size chocolate-covered caramel-peanut nougat bar into each cookie. Sprinkle cookies evenly with candy-coated chocolate pieces. Found this delicious recipe and could not help but to make it for a lovely event. I never knew lasagna noodles could taste so sweet. Cook the pasta according to package directions. Rinse, drain and set aside. In a medium bowl, stir together the ricotta cheese and ½ cup sugar. Set aside. In a food processor, purée 4 kiwis with 2 tablespoons sugar. Transfer the purée to a bowl and set it aside. Rinse the processor bowl. In the processor, purée half the strawberries with 2 tablespoons sugar. Strain the purée into a bowl and set it aside. Rinse the processor bowl. In the processor, purée half the blackberries with 2 tablespoons sugar. Strain the purée and set it aside. Slice the kiwis into ¼-inch thick rounds. Slice the strawberries into 1/8-inch thick pieces. Slice the blackberries in half. Reserve 1/4 cup of each of the purée to use as a garnish when serving. 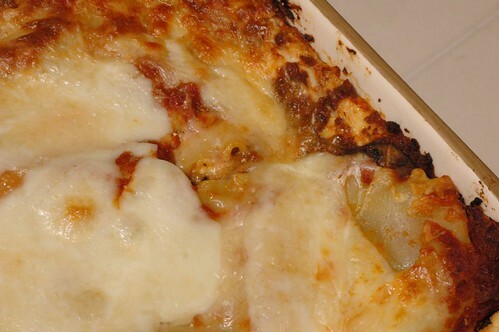 To assemble the lasagna, first cover the bottom of a 9-inch-by-13-inch glass baking pan with 3 pieces of pasta. Spoon 1/3 of the ricotta on top and spread it evenly. Pour the kiwi purée over the cheese and arrange the kiwi slices on the purée. Lay on 3 more pieces of pasta and cover with 1/2 the remaining cheese. Pour the strawberry purée over the cheese and sprinkle with sliced strawberries. Lay on 3 more pieces of pasta and cover with the remaining cheese. Pour the blackberry purée over the cheese and sprinkle with blackberries. Top with a final layer of pasta. Cover tightly with plastic and refrigerate overnight. Just before serving, sprinkle the lasagne with the remaining 2 tablespoons sugar and the toasted almonds. Cut into 8 rectangles and use a spatula to set the pieces on dessert plates. Decorate the plates with dots of reserved purées. 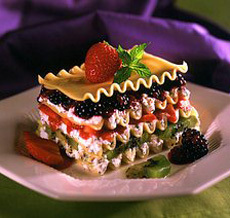 Garnish each piece of lasagna with a strawberry and a sprig of mint.